The bold design of this ISO-compliant Promaster Diver's watch is sure to turn heads. With Eco-Drive Technology, it is powered by light and never needs a battery, so you'll never need to open your caseback or compromise your dive again. Featured in stainless steel with a black bezel and matching black dial, one-way rotating elapsed-time bezel, anti-reflective crystal and water resistant to 200 metres. 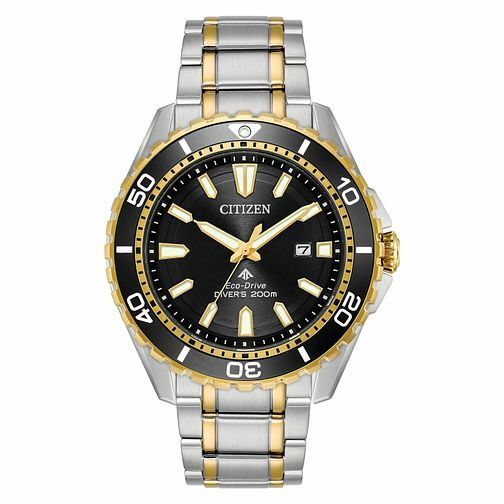 Citizen Promaster Diver Men's Stainless Steel Bracelet Watch is rated 4.5 out of 5 by 2. Rated 4 out of 5 by Anonymous from Good looking quality watch but date window too small! Great looking quality watch but Date window too small.